Was General Musharraf's seizure of Kargil heights in 1999 in Kashmir a blunder? How was it different from India's seizure of Siachen Glacier from Pakistan in 1984? If these were similar actions, why was India's and the world's reaction so different? Coming soon after Indian Prime Minister Atal Bihari Vajpayee's Lahore visit and the signing of the Lahore Declaration, how did Kargil change the course of India-Pakistan history? 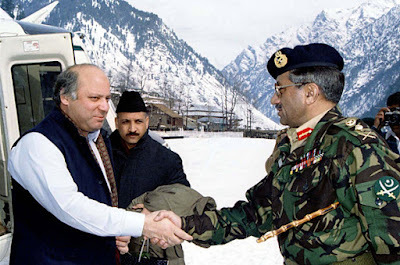 Did Kargil lead to the 1999 Coup against Prime Minister Nawaz Sharif? Did Sharif err by firing General Musharraf while he was representing Pakistan overseas and then denying landing permission to the PIA commercial flight brining General Musharraf home? Was the coup staged by General Pervez Musharraf or the Pakistan Army Corps Commanders while he was still in the air? Did Nawaz Sharif's failure to manage civil-military relations contribute to his problems and the coup? Did Musharraf blunder by siding with the United States after Sept 11, 2001 terror attacks in America? What was the alternative? How would the US react if Musharraf had refused to cooperate? Would the porous Afghan-Pakistan border allow Pakistan to be a silent observer? Is it 1971 Moment in Pakistan's History? The negative was wrecking the economy and ensuring screwing Pakistan became top priority for India leading to 1971.. The objective of liberating Kashmir failed. Yup correct while not friendly India clearly and correctly had other priorities 1949-1964 was spent on institution building and heavy industrial and higher education building..but then Nehru was in a different league to those that came after Jinnah..
"Was General Musharraf's seizure of Kargil heights in 1999 in Kashmir a blunder? How was it different from India's seizure of Siachen Glacier from Pakistan in 1984? If these were similar actions, why was India's and the world's reaction so different? " 1984 - At that time there was no clear demarcation or LOC around Siachen area. The last post managed by Ind and Pak were far apart, leaving Siachen as some sort of a buffer zone. India was not the only country planning to take over Siachen. Pak too was planning to do the same. As India placed an order with a British firm for high altitude gear, some alert Indian in that British firm noticed that Pak also has placed the same order. He notified Indian authorities. Some money changed hands and Indian army got the gear first. The loss of Siachen was so embarrassing for Pak and Zia in particular that they never acknowledged it in public. This is the same reason for not acking Uri surgical strike in 2016. 1999 - When Pakistanis stole Siachen, there was a LOC in that area and India had full locus-standi to publicize it and go for war and take it back. Granted LOC is not international border, but it has enough sanctity for a country to take military action if it is violated.